America’s “Greatest Generation” right down to her hard-working nature and classic American recipes. She taught me how to sew, to pray the rosary and, most important, to never arrive or leave a family gathering without saying hello and goodbye with a blessing to the forehead. Sadly, my grandma passed away recently, and we were recalling her goodbyes after a visit to her house. She would stand at her front door and wave to us as we drove off. That window-framed image of her waving will forever be etched in my mind. Right after Grandma’s funeral, my uncle and I had a conversation about getting copies of her recipes to share with the family. He said that her favorite was a lemon Jell-O molded dessert salad she would make in the summer months. What? With all of the great recipes she had, her favorite was a 1950s-era American fad served right next to the ham, á la June Cleaver! But after some chuckling and thinking about it, it made total sense. Grandma loved the warmer months, and she always enjoyed anything refreshing. And with Grandma once again proving herself to know best, I have to say, after making it myself and trying it, it is refreshing and delicious. I have noticed since her passing that while I knew so much about her, there is still so much I did not know, like her preference for a simple Jell-O salad. She has left a wonderful, but unique, legacy to everyone who knew her so that each person she touched was given something special and beautiful. But the most important gift she left behind wasn’t a recipe, a memento or even the fondest of memories. It was the legacy of faith she passed on to all of us. So in answer to Pope Francis’ question, “What will I leave behind?,” my grandma could honestly answer, “A lot!” How might we be able to answer that question when it is time for our final farewell? That’s up to us. In a mixing bowl, dissolve gelatin in hot pineapple juice. Add cold ginger ale and stir until completely dissolved. Stir in shredded cabbage, pineapple tidbits and chopped cashew nuts. Spray the inside of a larger gelatin mold or fluted cake pan with nonstick cooking spray. 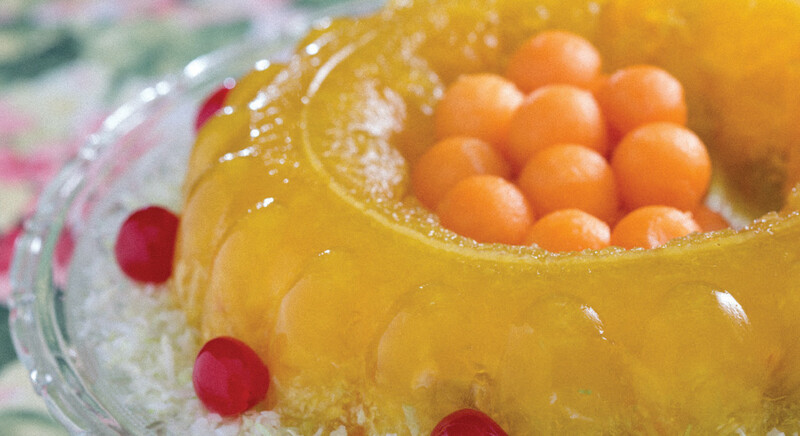 Place cantaloupe balls evenly inside Jell-O mold or cake ring. Gently pour mixture into mold and refrigerate until solid. Before unmolding, place mold in warm (not hot) water for about 10-15 seconds. Gently unmold on a serving plate and garnish with crisp shredded lettuce (or cabbage), extra melon balls or maraschino cherries. by MICHELLE DIFRANCO is a designer and the busy mom of three children.